Express your love and sympathy by giving the “gift of water” in memory of a loved one. 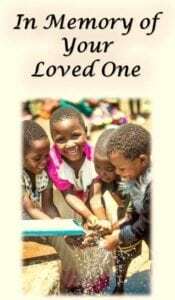 We will send a beautiful card to the friends or family on your behalf letting them know of your donation to Wells of Hope International. The gift will give clean water and life in honor of their loved one. The information below is needed for making and mailing the card. We will send a card notifying the recipient of your gift to Wells of Hope International, Inc. “In Memory” of their loved one.